University Drive Bridge reopens to motorists on the morning of Friday, March 8. The bridge has been closed since October following an inspection that showed the bearings required immediate attention. Severe weather throughout February slowed the pace of repairs, however, only delayed the reopening by a week. During the closure, the bridge remained open to accommodate pedestrian and cyclist traffic. The crossing remains a shared roadway and vehicles will still not be permitted to pass bicycles anywhere on the bridge. The opening of University Drive Bridge to motorists is now scheduled to take place on Friday, March 8. Early February's severe weather — including freezing rain, snow, and extreme cold — slowed the pace of repairs and delayed the reopening by a week. Particularly during the freezing rain, work had to slow down or even halt for a few days to ensure worker safety,” said Elizabeth Krische, Western’s Associate Vice-President (Facilities Management). The bridge has been closed to all but pedestrians and cyclists since October 18 after an inspection showed deterioration in the bearings that help the bridge to flex under load in fluctuating temperatures. In an effort to open the bridge as soon as possible, contractors have been working 10- and 12-hour days. Bearings on both ends of the bridge have been replaced, but there are still 590 rivets to be removed — each of them six centimetres long, and original to the 95-year-old bridge — so that the bridge can be jacked and the centre-span bearings replaced. Cars, trucks, ambulances and regular-sized transit and shuttle buses will be able to resume using the bridge. However, a 12-tonne load limit will remain in place that prohibits concrete trucks and fire trucks from crossing. Upon re-opening, the bridge remains a shared roadway and vehicles will still not be permitted to pass bicycles anywhere on the bridge. Following the in-depth bearing inspection in November, work to repair the bridge will commence on Monday, January 7. During the work, the bridge is expected to remain open with some restrictions. Pedestrians will use the walkways along the outside of the deck and cyclist will have access to a section of the roadway. Equipment and supplies lay down space will take most of the roadway west of the bridge. Work is expected to be completed by March 1, 2019. A reminder to parking customers that all parking lots remain open during the bridge closure. Medway Lot is accessible from University Drive when entering campus from either Sunset Street or Richmond Street. 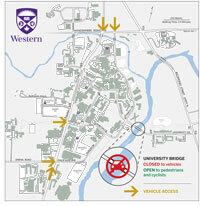 The linked map depicts vehicle access points to main campus. 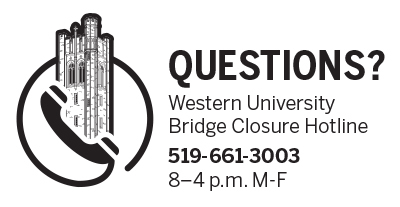 Western University will close University Drive Bridge to all motorized vehicles effective October 18, 2018 for the next few months. It will remain open to pedestrians and cyclists. The decision to close the bridge is based on recommendations from an outside structural engineering firm commissioned to conduct a routine inspection. The inspection found that the structure of the 95-year-old bridge requires repair. November, 1923 - New bridge, crossing the Thames River at Western University, opens to traffic. 2002 - major repairs improve traffic flow and pedestrian safety. Heavy trucks barred from bridge. 2016 - Engineering report recommends repairs, further load limits. March, 2016 - bridge closes for three days for necessary repairs, is re-inspected; traffic resumes. October, 2018 - engineering report notes damage to bearings that allow the bridge to flex under traffic load and temperature changes. As of October 18, motorized traffic will be prevented access; pedestrians and cyclists still permitted. LTC maintains a webpage for route changes. General information from that page is located below. Updates will continue to be posted on the LTC website and on this website on an ongoing basis; http://www.londontransit.ca/2018/10/10/university-drive-bridge-detour/. 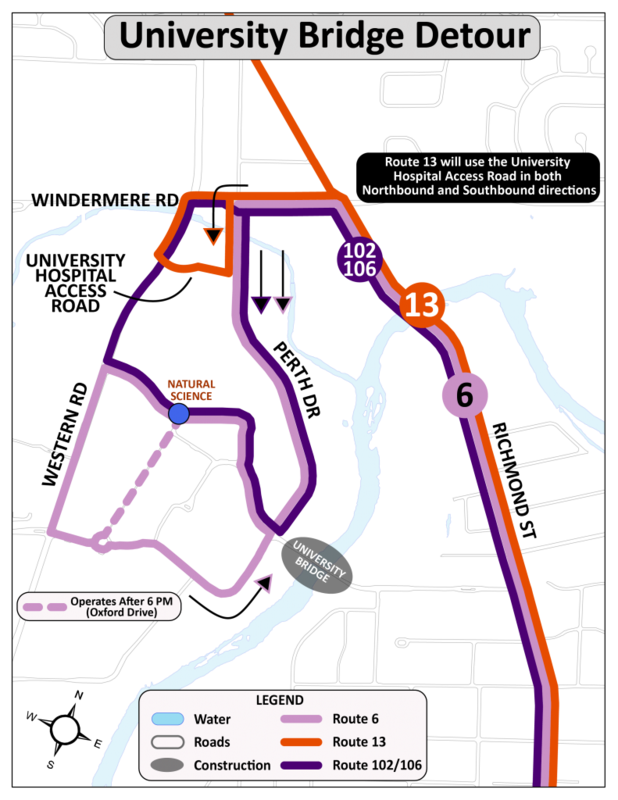 Effective from first bus out of the garage on Monday October 15, 2018 and until further notice, Routes 6, 13 and 106 will be detoured off the Western University Drive Bridge. During this time the following detours will be in effect.